Why are Flowers such a Memorable Gift? Think back to the last time a beautiful arrangement of flowers was delivered to your home. Was it your birthday? An anniversary or a ‘get well soon’ bouquet? Whatever the occasion, it’s probably fairly certain that you remember those flowers and how they made you feel when they were delivered right to your door. Think back to the last time a beautiful arrangement of flowers was delivered to your home. Was it your birthday? An anniversary or a ‘get well soon’ bouquet? Whatever the occasion, it’s probably fairly certain that you remember those flowers and how they made you feel. A beautiful bouquet of flowers is a true feast for the senses, combining eye-grabbing colours, delicate aromas and wonderful textures. As such, it isn't difficult to see by a bouquet of flowers can make such an impression on someone, making a special day even more unforgettable. The joy and excitement that a bouquet of flowers isn't easily forgotten, the radiance of the flowers being enjoyed after the big day itself is over. And remember, it doesn't always need to be a special occasion in order for you to bestow upon someone the magical gift of flowers. Sometimes 'just because' is reason enough; the spontaneity of a bountiful bouquet gifted out of the blue can make the gesture even more memorable due to the surprise factor. Sure, we might expect flowers or similar gifts on our birthday or anniversary, but flowers randomly gifted on an otherwise uneventful, overcast weekday in the middle of October can add that much needed ray of inspiration and optimism to help pull loved ones through the autumn months. Flowers appeal to our senses and our emotions, making them extra special as presents they won't forget in a hurry. 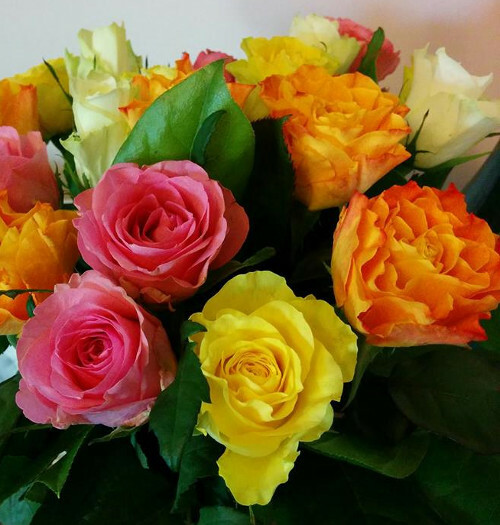 Take our Rainbow Roses bouquet (pictured above) for instance. Imagine receiving this as a gift. The explosion of colour and vibrancy expressed by this radiant bouquet of fresh multi-coloured roses would be sure to put a smile on your face. It's also sure to be a gift that will stay with them for a long time to come, summoning up favourable associations whenever the gift is remembered. Of course, these fond memories will also link to the gift-giver so if you want to get in someone's good books, flowers are a safe bet.